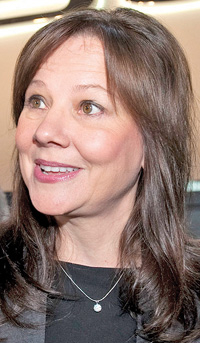 DETROIT -- It has been just over two years since Mary Barra became the surprise pick to steer General Motors' global vehicle development, instantly rocketing her from a relative unknown to one of the industry's highest profile executives. She'll get a report card soon. Over the next 18 months, GM is embarking on one of the company's busiest-ever launch schedules. Some of the vehicles will be the first cars and trucks developed soup-to-nuts on Barra's watch. "The stuff you'll start to see later this year -- this summer and fall -- those generally are going to be Mary's," says Doug Parks, GM's vice president of product programs and Barra's top lieutenant. "You can start to judge her soon." So far Barra can be judged on a measure not quite as exciting as fresh sheet metal: her behind-the-scenes overhaul of the 29,000-employee, $15 billion enterprise that creates GM's cars and trucks. If Bob Lutz's legacy as GM car czar last decade was the return of some spirit and style to the product portfolio, Barra's is the injection of discipline and rigor into the product-development process, so as to transform GM into a more nimble, more profitable carmaker. Last summer, Barra quashed the team structure that had been in use on GM's vehicle-development programs since 1996. Gone is a setup that often left three engineering execs bickering over, say, the placement of a cupholder. Now one lead engineer has sole control and accountability for the program. Barra, a 51-year-old mother of two teenagers, largely has banned costly, late-in-the-game changes to vehicle programs that routinely delayed launches. "She's bringing order to chaos," GM Vice Chairman Steve Girsky says. "And she does it in a calm, direct way." Barra's cut-to-the-chase style is meant to be an antidote to the dithering and redundancies that historically have slowed GM's development cycles and wasted money. "Too often in the past, we would waste time and energy by doing business with ourselves," Barra says. "My style is to have a rigorous debate before we start on something. 'Is it in or is it out? What are the most important products to invest in?' And then we just go." So far, insiders say, Barra has been committed to protecting Lutz's emphasis on compelling design, a function left vulnerable any time an automaker starts talking about efficiency and cutting cost. Barra shares her intolerance for GM's hidebound culture with her boss, CEO Dan Akerson. He surprised many people in early 2011 when he assigned Barra, then GM's human resources chief, to the product czar post, supplanting powertrain specialist Tom Stephens, who had taken over from Lutz in 2009. Akerson likes Barra's willingness to make tough decisions quickly, say insiders familiar with his thinking. Barra's restructuring of the vehicle-development teams sent 20 senior engineering executives into early retirement or to new duties. "That sent the message that if a system so ingrained can be blown up, we really are changing things," Parks says. In 2011, Barra pressed for funding for a new family of fuel-efficient small engines, scheduled to be launched next year. The program was pulled ahead by more than a year and also was green-lighted for about 2 million units. In the past, GM would have parceled out only a few hundred thousand at a time for each new vehicle program. "Mary helped me to very quickly push it through and cut off the debate," says Sam Winegarden, vice president of GM's global engine engineering. "It wasn't this drawn-out, torturous process that I've grown to expect." As a kid, Barra, a native of suburban Detroit, climbed over every inch of the interiors of Pontiacs brought home by her father, who worked as a die maker at GM's Pontiac Division for nearly 40 years. At 18, she got her first job at GM's Pontiac assembly plant, inspecting hood and fender panels on the Grand Prix. After graduating with a degree in electrical engineering from Kettering University, Barra landed an engineering job at the plant that produced the Pontiac Fiero. In the late 1990s, Barra worked for a few years as executive assistant to CEO Jack Smith and Vice Chairman Harry Pearce. She later was assigned to an internal communications post to manage the fallout from a crippling two-month UAW strike in 1998. In 2003 she was sent to run GM's Detroit-Hamtramck plant, where she oversaw launches of the Cadillac DTS and Buick LeSabre. In the mid-2000s, as vice president of global manufacturing and engineering, she helped set up flexible manufacturing that allows each GM factory to build vehicles of varying sizes and platforms. "Mary was on the leading edge in helping us get the ability to build these global platforms interchangeably across all regions," says Gary Cowger, then GM's global manufacturing chief and a Barra mentor. Colleagues say Barra encourages dissenting views. Compared with the larger-than-life presence of Lutz, a former Marine pilot and self-assured car guy, Barra takes a by-committee approach, one former executive says. "The idea of the strong-willed car guy who rides herd over the meetings -- those days are over," the executive says. Barra's emphasis on locking in decisions sooner has unsettled some insiders. The idea is to have key decision makers from design, engineering, marketing and other areas nail down the major aspects of a vehicle program to avoid later supply disruptions or launch snags. But a hard line can tie the hands of designers and product planners from making tweaks later that might be needed to stay competitive, warns John Wolkonowicz, an independent auto analyst in Boston. Parks points to the Cadillac ELR plug-in hybrid, shown at the Detroit auto show, to underscore the continued commitment to design. Although based on a 2009 concept, it's the first vehicle the public has seen that was developed entirely on Barra's watch. The coupe's edgy styling won praise as an example of a far-reaching design that emerged unscathed in the production model. Barra says Lutz did "a fabulous job institutionalizing how we generate a vehicle with great design." She says: "I want to be part of a design that's got great reach. My philosophy with the team is 'If it can be done, I want to do it.'"